We’d love your help. Let us know what’s wrong with this preview of Zero Footprint by Simon Chase. An insider account of the shadowy world of private military contracting. Simon Chase's life is a maze of burner phones, encrypted emails, secret meetings, and weaponry--all devoted to executing missions too sensitive for government acknowledgment. Working for the CIA's Special Activities Division, the U.S. DoD, the U.S. State Department, and British government entities, Cha An insider account of the shadowy world of private military contracting. To ask other readers questions about Zero Footprint, please sign up. UPDATED: Upon reading the reviews of this book on Amazon, it appears that the author has taken license with the truth. It may be that the author did not participate in any of the situations listed. That being said, I still found this to be a very good read, and in the case that it is all fiction, shame on the author. An incredible story! Chase (alias), a British Special Forces soldier who found himself an early retirement due to injury, continues his career as a private military contractor (PMC) UPDATED: Upon reading the reviews of this book on Amazon, it appears that the author has taken license with the truth. It may be that the author did not participate in any of the situations listed. That being said, I still found this to be a very good read, and in the case that it is all fiction, shame on the author. An incredible story! Chase (alias), a British Special Forces soldier who found himself an early retirement due to injury, continues his career as a private military contractor (PMC). Taking assignments as varied as a bodyguard for rich people, to stints with other special forces soldiers (retired SEALs, Delta Force, etc) in war zones throughout the Middle East. The author had many hair-raising adventures, it is amazing that he has packed so much living into one life. The chapters detailing incidents in Iraq, the Tora Bora region of Afghanistan, and Benghazi Libya were spell binding! Mr. Chase has an excellent ability to narrate, and the descriptions are so vivid that you feel you are there with him. If he can manage to stay clear of harms way long enough to write a sequel, I will be first in line to purchase it! On a side note, I was flabbergasted at the amount of money spent on PMC's. Bear with me while I give a quote from the book: "In November 2003, the US Congress established the Iraq Relief and Reconstruction Fund, which allocated $18.4 BILLION (!!!) to rebuild Iraq's infrastructure... That was on top of the $54.4 BILLION Congress had provided that year for Operation Iraqi Freedom, the $92.1 BILLION it set aside in 2004, the $58 BILLION in 2005, and so on..... The money was huge. So was the number of firms that showed up to bid for contracts - 181, according to a US GAO report - eventually employing AS MANY AS 190,000 CONTRACTOR AND SUBCONTRACTOR PERSONNEL." Wow! To paraphrase an old line, "Take a a billion dollars here, and a billion dollars there, and pretty soon you are talking about real money here". And equally incredible is the process used to circumnavigate Congressional Oversight by hiring the PMC's. And the fact that these PMC's are pretty much out there on their own; no backup from the regular military, and no disability pensions or life insurance if the situations go bad. In fact, the government can deny any knowledge of these people, no matter how heroic their deeds may be. This book was a real eye-opener for me. I highly, highly recommend this one! Very interesting book on PMCs who are doing the dirty jobs that Governments wants done without their footprint. Brings up details of covert jobs of failed missions to trace Bin Laden and delayed entry for helping the Syrian rebels. Those who like books relating to war zone activities this is very attention gripper. The book "Zero Footprint" by Simon Chase was a fantastic book. What I liked about it was how Simon told what it was like in missions, his experiences, lessons he learned, and why he joined the military. Simon also told stories that happened at base camp. I also like how Simon used abbreviations but in the beginning of the book he told us what they mean't for. I rate this book a 4. Simon Chase can improve on many things like, telling about more experiences, how many years it took him to be where h The book "Zero Footprint" by Simon Chase was a fantastic book. What I liked about it was how Simon told what it was like in missions, his experiences, lessons he learned, and why he joined the military. The author's purpose for the book Zero Footprint is to show the strength of a solider after getting wounded and being able to recover. The book is all about strength because being in harmful situations, you have to think fast and keep you head in all the things that are going on around you. The author was able to tell and show this in his book by it being a true story. I think the audience for this book is older teens and adults because of all the terms and detail being told in the book. It might be hard for younger kids to understand what is going on. The theme of the book is mental toughness. The reason why it is about mental promise is because in extreme conditions you have to be able to think fast and be able to complete the important tasks. During this book this solider got wounded and after getting his health back he had to keep his mental toughness to get him through all the bad times. A lot of soldier's go through PTSD and have trouble keeping their mental toughness which is very important. The book was written in first and third person because the author put some of his own words in the book as well as word coming from the solider. This book was a narration by it being told in times and places. It also was about a event which was war over seas. Interesting read, apparently discredited. I enjoyed the storytelling but cannot say if it's real or fiction, but then again, I assume most first person non-fiction is exaggerated or fictionalized either by choice or the vagaries of memory. bring to those reading this book, the very real and down to earth lives of private soldiers, mercs, soldiers of fortune. Those names however bring with them negative connotations. Even though most of these men & women carry with them the same beliefs as when they were in nation state militaries. A book made up of different private contractor experiences by the author (pen name Simon Chase) from Afghanistan- hunt for Bin Laden, Syria- proof of chemical weapon use, Benghazi- purchase weapons and the secret CIA Annex- they were there. It was an additive to books I've already read or news events such as 13 hours, Dark Forces with the role of purchasing weapons in Libya for their use to support Syrian rebels. An interesting read. The author takes the reader on a journey that spans the globe, from South America to the Levant. I found this book hard to put down. The narrative focuses on a private military contractor and the scrapes he gets into. This book would actually make a very interesting movie in line with Zero Dark Thirty and 13 Hours. I would recommend this book to anyone interested in current events. Quite an enjoyable book. While there are claims that this book may not be wholly factual, which I only discovered when completing my review, that does not diminish the quality of the writing or the story. It is very well written, an engaging story and well worth picking up, even if you believe that the story may be stretched (which I have no reason to believe). Excellent insight into the world of private military contractors across the Arab nations. The amount of money spent in bribes and inflated costs is amazing. Only problem was with the use of abbreviations for all of the organizations, tactic and personnel. There was a glossary to explain these, but got tired of referring back to it. Enjoyable read. A great ‘airplane book’ - quick read and exposes some varied complexities, dangers, and implications of an at times murky and poorly defined projects that Private Contractors support. Real life examples. The real witness accounts of Benghazi sure do conflict with the political narrative. The book was good. Very well written. Like others, I doubt most of this happened. So while I did enjoy the book, I think the author should be honest about its truthfulness. UPDATE: When I went to post my review on Amazon, I was surprised to find that the vast majority of reviewers stated "Simon Chase" exaggerated and even outright lied about many of the events depicted in "Zero Footprint". Well, no wonder my review below stated that this felt like a "novel" because it apparently was a well-conceived work of (mostly) fiction. Thus, I now add the caveat that although I liked this book, I am greatly disillusioned and disheartened to know that there are a great many un UPDATE: When I went to post my review on Amazon, I was surprised to find that the vast majority of reviewers stated "Simon Chase" exaggerated and even outright lied about many of the events depicted in "Zero Footprint". Well, no wonder my review below stated that this felt like a "novel" because it apparently was a well-conceived work of (mostly) fiction. Thus, I now add the caveat that although I liked this book, I am greatly disillusioned and disheartened to know that there are a great many untruths to be found within its pages. Would that more Special Forces/Covert Ops books utilize professional writers (journalists or screenwriters, for example) to ghostwrite. Of the over half a dozen similar books that I've read, this is by far the easiest, most comprehensible book to read. The prose is such that the book reads like a novel. The timeline is mostly linear, the technical lingo did not intrude to the point of confusion, and the characters fairly memorable. I never felt as though "Simon" rushed through any part of the book. Even the early chapters describing his childhood and subsequent start in the military were well-treated. I credit a large part of this to Ralph Pezzullo (and perhaps also the book's editors) who seem to have a good sense of when to draw out a story, and when to wrap it up. The title (and subtitle) were a little misleading because Simon discusses other jobs that don't involve Syria or Libya. But, this book is all the better for that. I didn't mind at all reading about his foray to rescue a girl whose father kidnapped her and took her to his native Pakistan, or Simon's decision to help a Hollywood star rescue his adult daughter from being pimped by the gang-bangers she fell in with. Rather, these non-military exploits just humanize Simon more, and make him seem less like a GI-Joe type. 3) when Simon and his cohorts came to the aid of all the people (Ambassador Stevens et al.) caught up in the horrific attacks of the US Compound and CIA Annex in Syria. At the end of the book, the author pointed out that the general public has an image of private military contractors (PMC) as mercenaries or thugs. I suppose Simon felt the need to put a shine on his image and that of his close colleagues. Another aspect of this book that made me raise my eyebrow was the fact that the author just happened to be involved in two of the most pivotal events of the Middle East in recent years - the hunt for Osama bin Laden and the attacks in Benghazi. That's really quite astounding that Simon just happened to be called upon in these two events. UPDATE: now I know why (see my Update above). Reading through the various chapters wherein the U.S. Government (USG) spends billions upon billions of dollars on ill-fated ventures in Iraq and Syria, I just have to wonder (and am disgusted) at the waste of it all - money and lives. With hindsight, it's easy to see that the West was naive, arrogant, and maybe even blind to the realities of the Middle East. It may be heartless to think this way, but I feel countries should be largely left to rise (or sink) under their own efforts. Unless there are underlying conditions that would make it extremely amenable to peace, progress and prosperity, Western governments should have a hands-off approach (especially in the Middle East) to countries around the world. [Of course, my view is hopelessly naive since big corporations would love to shape countries and events to their own benefit, and those corporations have powerful government friends who no doubt use their power and influence to help their private sector buddies. If Simon is to be believed, a small scale version of this was the Pakistani Divorce Case of Chapter Ten]. I am glad this book was written because it gives lay people a peek into the secret and murky world of PMCs. For good or for bad, it appears PMCs will continue to occupy a place in the world whether people want them to or not. While I do not profess to have any knowledge of military culture/life/struggles let alone the grey world of Private Military Contractors (PMCs), I cannot help but think that there is something more here. It reads like a war veteran that has had a few drinks and quite a few stories under his belt. However you can discern the tension and realization Mr. Chase elaborates about the PMC conundrum, which is not immediately clear within any particular chapter. The fact that he realizes he is a tool for While I do not profess to have any knowledge of military culture/life/struggles let alone the grey world of Private Military Contractors (PMCs), I cannot help but think that there is something more here. It reads like a war veteran that has had a few drinks and quite a few stories under his belt. However you can discern the tension and realization Mr. Chase elaborates about the PMC conundrum, which is not immediately clear within any particular chapter. The fact that he realizes he is a tool for the rich, powerful, and self-interested bureaucrats /politicians, but tries to mask the disquieting truth through some sense of a quasi-nationalism/patriotism/humanitarian guise. While it might seem like these stories have been extraordinarily embellished, I can imagine that there are PMCs that are so highly skilled, trained, and sought that they could be sent to multiple war zones as Mr. Chase claims. I think of it this way, with the number of elite special forces that retire every year to work in the PMC world, there are most likely some that have built a skilled repute after so many years. Whether or not you choose to believe these stories, which at the worst severe exaggerations (backed by officials editorial reviews of people that work within the field--see amazon) or at the least uncomfortable truths that happen to read like a movie script. As for the amazon reviews, I take those with a grain of salt since many of the accounts criticizing the book seem to make unfounded claims and were created solely to debunk the author. I think if you were interested in learning more about the PMC world, there are certainly many more scholarly-minded books that have been written. Certainly many of the events such as Tora Bora, Benghazi, and Syria can be read about in other accounts. This wont be the last book written about the conflicts in the Middle East and it certainly shouldn't be your only angle by which to see the conflicts either. In any case, it's a great narrative and especially more fun to listen to as the particular voice actor picks up on Chase's subtle sarcasm, light-hearted jokes, and personal struggles. I personally enjoyed the style and author's assumption that the audience has little to no knowledge of military/PMC culture. He even goes so far as to spell out every acronym he uses! They say reality if often stranger than fiction ... Reading this book, you'd find this very much the truth. Some reviews say this was a totally fictionalized account - it may be so, but if you want to forget the 'reality' aspect and indulge in stories of 'that' dangerous world, then this book is for you. It felt like following this team, composed of the author and then the men he works with. You come to care for them, in a way (I was appalled when it is mentioned one of them committed suicide at They say reality if often stranger than fiction ... Reading this book, you'd find this very much the truth. Some reviews say this was a totally fictionalized account - it may be so, but if you want to forget the 'reality' aspect and indulge in stories of 'that' dangerous world, then this book is for you. It felt like following this team, composed of the author and then the men he works with. You come to care for them, in a way (I was appalled when it is mentioned one of them committed suicide at some point). Think TV show The Unit ... but this here is the 'real' deal. Lots of details, of information regarding what it really is like on the ground, in the field. You experience the thrills, the fear, the horror at what humans can do to other humans. This book bares it all totally naked, showing you everyone as humans before they belong to ethnicities, religions, etc. In some ways, this book just plods along, and we aren't really sure where we're going. But in the middle is an insiders view of the Benghazi attack. And then it goes on. There is a lesson here about how the world has changed, how governments get things done that they can't, or don't want to do with their military. You also see the ugly side of the news stories you hear about the middle east and ISIS, and what is happening to those countries. I'd recommend it just for the Benghazi chapter. I found this book interesting and it helped me to appreciate the choices men and women make to do what they believe in. Like some other reviews, I have a hard time accepting the author himself (since the book is written from his perspective) experienced every event written in the book....from Tora Bora, to Somalian ship hijackings, to Fallujah and post Iraq security, to the revolution in Libya (including the events of Benghazi). None the less, the book will keep you reading. Interesting stories from the viewpoint of a PMC, only it appears that the stories are not his own... I found dozens of disavowals of this man, his life, his service, his exploits, and not a single one supporting the man identified as "Scott Charnick"!!! The book was was good because it provided information on military things that I never new about. I liked that it was non-fiction, but still told in first person. The book held my attention throughout the whole time I was reading it. The book had traces of profanity throughout the book, but it was still a great book. I would recommend this book for anyone who like the military and reading. Great book, and an easy read. 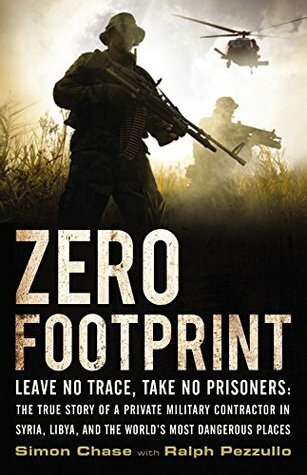 Zero Footprint takes you inside the life of a private military contractor- their struggles with civilian life, relationships, life experiences, etc. It was interesting to see how the lives of many contractors cross paths along the way. Very interesting read. I doubt that there was too much literary license taken here, and the biggest take-away for me is a confirmation of a long held belief that the American public is woefully mis and/or under informed by our media and our government. Military books are not my usual cup of tea, but this makes an interesting read anyway as it tells me of a world that I had not knew prior of. Excellent book based on true events. My only question is how much is true and how much is embellished to make the stories livelier.